Top tourist attraction Wookey Hole Caves has extended its Halloween offering to ensure families in Wales are able to visit this October half term. While the rest of the UK’s half term dates run from October 23-27 the Autumn half term in Wales is between October 30- November 3. Managers at Wookey Hole Caves in Somerset have decided to extend their special Halloween activities until November 5. Dubbed as the ‘Home of Halloween’, Wookey Hole Caves with its resident Witch and atmospheric cave tour, offers over 20 indoor and outdoor activities for families to enjoy as well as seasonal Halloween fun. 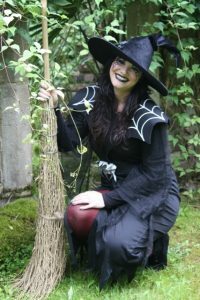 This Halloween a brand new attraction will be available as visitors are invited to learn how to ride a broomstick! The Witch of Wookey along with the wizarding professors will put trainee flyers through their paces as they learn to mount, dismount, manoeuvre and accelerate on their broomsticks, making for some great photo opportunities. Visitors will also be impressed with the brand new Witch’s Grotto which is buried deep beneath the Mendip Hills, within the historic Wookey Hole Caves, where every child will get a free treat. The high-energy performances during the daily Halloween Circus Shows are also sure to delight. 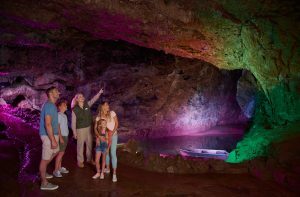 Wookey Hole Caves managing director, Daniel Medley, said: “We know how popular we are with Welsh families, especially during school holidays so when we realised that the Welsh school half terms didn’t fall within our planned Halloween dates we decided to extend our offering. “As well as all the usual attractions you can expect to find at Wookey, we also put on special seasonal activity during holidays and Halloween is no different. We didn’t want anyone to miss out on the broomstick flying lessons, Witch’s Grotto or Halloween Circus shows and workshops so we roped in more staff, changed our marketing and made it happen! “The broomstick flying classes will be a particular highlight as we’ve never done this at Wookey before. The Witch of Wookey always manages to fly into things and fall off her broomstick so we’re hoping the lessons help her as much as anything else! “This along with the other attractions on offer including our world-famous caves, 4D cinema experience, Adventure Golf, Circus Show and Dinosaur Valley makes for a really good-value day out for families across the West and Wales who can also enjoy the beautiful surrounding region of Somerset. “We have also recently invested in high-quality accommodation options on site and nearby for those who want more than a day trip. A creepy guided tour of the spectacular Wookey Hole Caves is one of the highlights to expect from a day out at Wookey. Featuring brand new caverns, tunnels and subterranean lakes only recently opened to the public, the cave tour promises history, mystery and cave-aged cheese. Other spooky themed fun on offer this October half term include the special Halloween Circus Show which takes place daily from 21 October until 29 October and on 4 and 5 November. Circus Workshops will take place from 30 October until 3 November and the 4D cinema will be terrifying and delighting audiences with the exhilarating Dracula ride, housed in the haunted Witch’s Laboratory. Also included in the ticket price is the Magical Mirror Maze, Haunted Fairy Garden, Wizard’s Magical Play Barns and Valley of the Dinosaurs. Holiday packages at Wookey Hole Caves start from just £129 with accommodation available at the hotel or the luxury lodges both onsite. Packages also include breakfast with the Witch of Wookey, tickets to Wookey Hole Caves, a round of crazy golf, Halloween fun packs and entry to the Mill and children’s play areas in the evening when eating in the restaurant. For more information or to book please visit www.wookey.co.uk. Get 20% off by booking Halloween tickets online.